Why should industry bother safely disposing of waste? What are the environmental benefits? And how does it affect me? The answer is in many ways, some you might not have considered. If your travel plans have ever been foiled due to a smog alert, you might unwittingly have been the victim of sloppy waste disposal. Smog occurs not only as a by-product of transportation emissions, but also from the output of factories not engaging proper, environmentally friendly waste management strategies. Recycling of solid waste has obvious benefits. If solid waste can be reused and utilised in other applications, the amount of solid waste is going to be greatly reduced. When large amounts of solid waste get into our environment, the various disease carrying insects and rodents that are drawn to these sites compromises public health. If you’ve ever rued the sight of a toxic waste dump, spreading its tentacles through the surrounding environs, you should know that it would have been avoidable with proper, safe waste disposal management. Recycling and reusing industrial waste materials can create new products. Further consumption of natural resources is therefore greatly reduced, with obvious benefits to the environment. Such company’s like Exfoliators are employing safe disposal of waste. Many studies demonstrate the detrimental effects to health from exposure to industrial waste. By employing safe waste disposal techniques, industry actually has the power to improve the health and wellness of residents in their vicinity. This is not hocus pocus or heresay. Certain types of pollutants called EDC’s, or endocrine-disrupting compounds, can cause reproductive problems in humans such as low sperm counts, infertility, miscarriages, and endometriosis. Dioxins, polycyclic aromatic hydrocarbons, pesticides, and heavy metals have all been identified as EDC’s. Careful waste management of these common industrial materials is doubtless the only responsible approach. Chemicals are one of the cancer causing compounds to hit this induatrial revolution. How much more if chemical wastea are dumped improperly? There should be strict enforcement on laws governing the issue. Garbage disposal is very critical and in most cases we end up running out of space to dispose them so it is very important to recycle. I'm actually familiar with this garbage disposal. In our barangay in Marikina, it is a crime if we didn't segregate those non-disposables from the disposable ones. And We have to wait for the garbage truck to pick them up in our area. We are not allowed to bring them waiting in the side streets. Haha! This is really important. We have a good segregation of garbage around here but Germany has a more impressive one. They even separate organic trash from the "restmüll" while we only have bottles, paper, appliances and such sorted. I wish we could have what Marikina did at all places sa Pinas no? 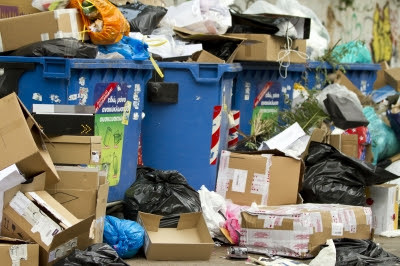 Proper waste management and disposal are very important in the society. Cleanliness and orderliness make a healthy environment free from illness. Discipline is the main key here. It is all about proper waste disposal and how serious people about this. At the end of the day, without our concerted efforts all of us will suffer on the pollution it might bring.